as Delivered: CloudFoundry, the heaven for open Apps ? CloudFoundry, the heaven for open Apps ? The cloud is in good shape. 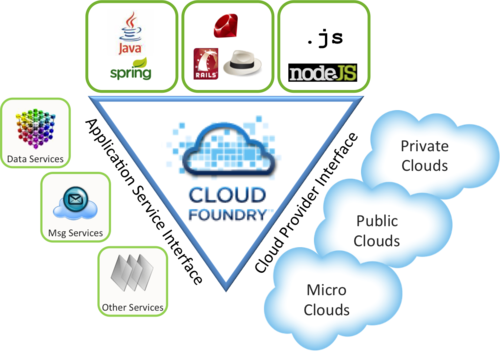 VMWare has released their new PAAS platform, called Cloud Foundry. It is not a surprise. VMWare with their divisions, such as SpringSource or hyperiq, it’s in a very good position for bringing us a completely full and top rank PAAS. In fact, Cloud Foundry, can support multiple frameworks, multiple cloud providers, and multiple application services, all on the same platform. This is a good new, really. We already have some others PAAS platforms, focused on java, such as google's appengine. However, there is a plus. We mustn't forget that SpringSource, who makes the base framework of the majority of best of bread java products such as Alfresco or Liferay, is a VMWare division, and it’s at the core of this platform. Good. And another plus: one of the stronger virtualization technologies at the back. And of course, with all experience from their vFabric Product Family. We can tell that Cloud Foundry is a step over the limits of other cloud approaches. One thing is sure, is new, fresh and will push other competitors like Google or Microsoft to rethink some features of their stacks. Until now, with some exceptions, PAAS was tied to a particular environment. By example, .NET for azure, Java for Amazon's Elastic Beanstalk. And they weren’t full frameworks. By example, Java for google appengine, is a reduced set of what is java. This technology concentric approach was a strong handicap for a manager which wants to take a decision of migrating developments to the cloud: vendor Lock-in, lack of cloud portability. Another big handicap that was having these cloud systems, was the fact that only we could deploy on public clouds. This hits another time the portability. But for some financial and government organizations, it’s just, not an option. With Google’s appengine we have some options for mounting private clouds, such as https://elasticserver.com/, anyway. The proposal of VMWare is far from these limitations. They offer us a wide range of frameworks as Ruby, Groovy, Java or Node.js. And the most important: the promise that some other frameworks are coming. With CloudFoundry you can deploy against public and private clouds, as you can run them on the top of vSphere and vCloud. This is great, too. CloudFoundry code is Open Source, under Apache License. 1.- From the manager and architect perspective, the PAAS platform, as show us Google or Microsoft, makes easy the definition and governability of the IT infrastructure: this is the cloud framework, these are the cloud libraries, this is the cloud way to work. With this open approach, now, the people must define more, like we do onsite. This will be more configurations, more particularities, more work ... more cost. 2.-Some months ago I try to deploy Liferay on Appengine. Just for fun :) However, the google’s big table model made me desist. VMWare data services will use MySQL, or big tables as MongoDB or redis. I would like to see the pricing and how they manage the connectivity against the database, specially, MySQL. In other words, if for use my app I must change my app’s persistence layer, I don’t thing will be a great deal. At glance, a big PAAS approach from , I think, the most prepared player. We will see how its perform. You can sign up free at http://www.cloudfoundry.com/. It looks like if deserves a try. Another good point to think, is the VMWare’s bet for PAAS concept. SAAS and IAS are very well known approaches, and PAAS was like the third way. But every day more, PAAS shows as that can be probably the best goody that the cloud can bring us. Copyright © 2008-2011 as Delivered .